Week Two of doing the Picks of the Day over on the ENN News Network, then doing a weekly roundup of them here. I’d really like to know what you fine readers think of the change, so please comment away. For a lot of you, it probably doesn’t matter, because you see these on Facebook or G+, regardless, so I am guessing it’s fine either way. If there’s enough of you for whom the actual Sean’s Pick of the Day site is important, I might have to consider going back to the original way. So… let me know! The Adventure Outline Maker is for just those kinds of moments. Using a series of d100 tables it creates an adventure outline, with contact type, your quest/mission, where it is, and what complication there is, or what help you may get, even a suggested reward. This outline is then used to help you come up with a full adventure or side quest. 8 d100 tables that can be combined in a high number of ways to produce an outline in a simple and easy way. Contact – Personality & Contact – Profession tells you about who gave you the quest/primary point of contact. Complication – If something can go wrong, this table tells you what it is. Reward – What have you been promised as a reward for your endeavours. Seriously, Ennead is great at this kind of thing, and the price is ridiculously low for the value. Remember that Ultramodern5 thing I’ve been talking about? Honestly, I’d be seriously surprised if you’ve not already encountered it – it’s the current top-choice for anyone wanting to take the 5e rules and use them for post-swords-and-sorcery gaming. Dias Ex Machina Games is already expanding on the core, using this new release to add superpowers and related abilities to your campaign idea. History once spoke of individuals able to accomplish miracles, eventually eradicated or bred out by a population too frightened of what they didn’t understand. As science filled in the void left by absent gods, these gifted individual decreased until they became all but extinct. But they never completely vanished. Each generation, such a rare being appeared with abilities subtle to extreme. However, despite their desire to reveal themselves, forces continually prevent them from doing so. To many of those who know them, they’re of an inferior class. To others, including themselves, they are considered an improvement on the design of man, an upper echelon. 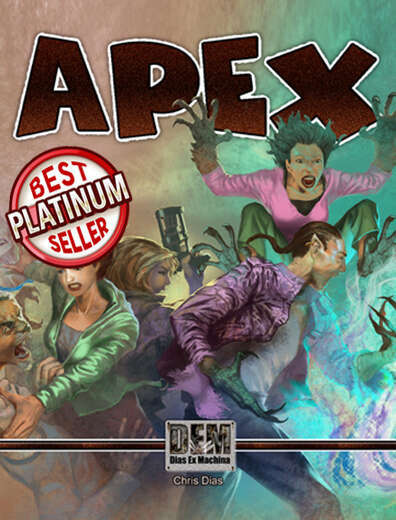 Apex is a module for DEM’s Ultramodern5, a plug-in rather than a full setting: a set of rules and ideas to allow any number of homebrew settings to work within it. There is a basic background involving people who gain unnatural powers, but don’t let that limit you if you wish to use it as a jumping off point. –Tier-based talent acquisition. Over 180 upgradable super-powered talents, totalling over 950 different variations. –New sacrifice rules to trade penalties for new talents. –Eleven new backgrounds and apex-themed life events. –Eleven new ladders to focus your superpowers. –New adversary templates and monsters. You’re going to need both the core 5e D&D rules and Ultramodern5 to use this. Louis Porter Jr. is arguably one of the hardest working folks in RPGs. The sheer volume of material coming out of LPJ Design is kind of mind-boggling, and he’s definitely a Pathfinder powerhouse. Now you can get into his Infinite Dungeon, which he started up on his Patreon and is now offering up via DriveThruRPG. Built on the lip of the mountainous crater that surrounds the Halls of the Eternal Moment, Cusp caters almost exclusively to adventurers. Heroes, travellers and thrill-seekers alike come and go from the town all the time – and since Cusp is the last place to spend time, or coin, before one enters the Halls in the crater below, they do their best to extract as much of it from passers by as they can. Of course, as people do occasionally come back out of the dungeon, Cusp also offers adventurers a chance to sell their hard-won spoils to a wide variety of art collectors, historians and eccentric wizards who call the City at the Edge of Eternity. In the simplest form, the Infinite Dungeon is a daily Patreon-sponsored megadungeon, that has dozens of explorable rooms and levels. The idea of the Infinite Dungeon was inspired by the online series, Dungeon-A-Day created by Monte Cook (co-designer of 3rd Edition D&D). It’s usable, in whole or in part, in any campaign setting. Although it may appear to start out like a conventional dungeon, as you get deeper the full scope of the adventure, and the unique challenges presented, become more and more apparent. 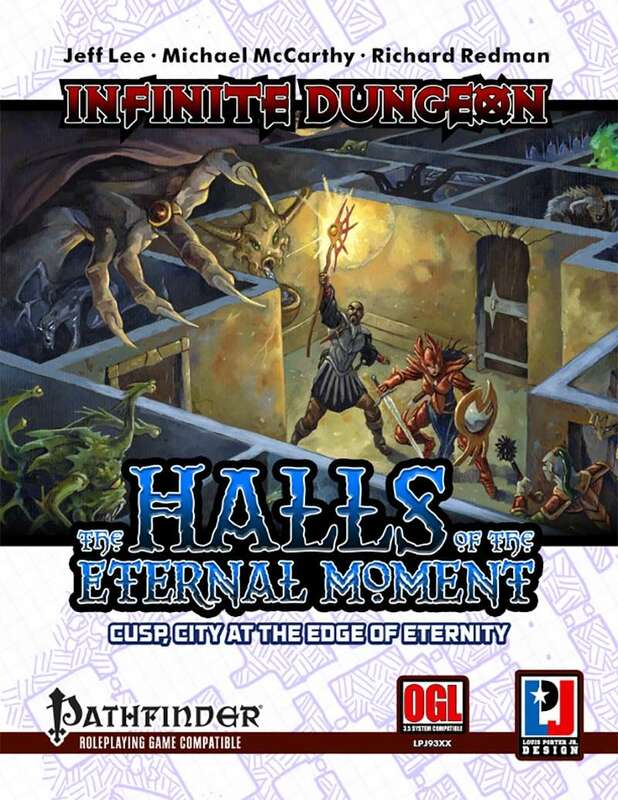 This first Infinite Dungeon is called the Halls of the Eternal Moment. I highly encourage you take a look through the rather enormous library of stuff LPJ Design has up. There’s some real creativity mixed with fine graphic design and other presentation, and you’ll not want for content for quite some time. The RPG community has no more well-read, prodigious, or fascinating sage than Ken Hite. He’s brought his expertise and propensity for exceptional research as it applies to gaming to the subject of one of the most famous entities in all of fiction – Dracula. Whether you wish to bring the famous Prince of Darkness to your setting directly, or use the lessons of his story to craft your own master villain in the shadows, Ken’s work here is indispensable and a fine read, to boot. 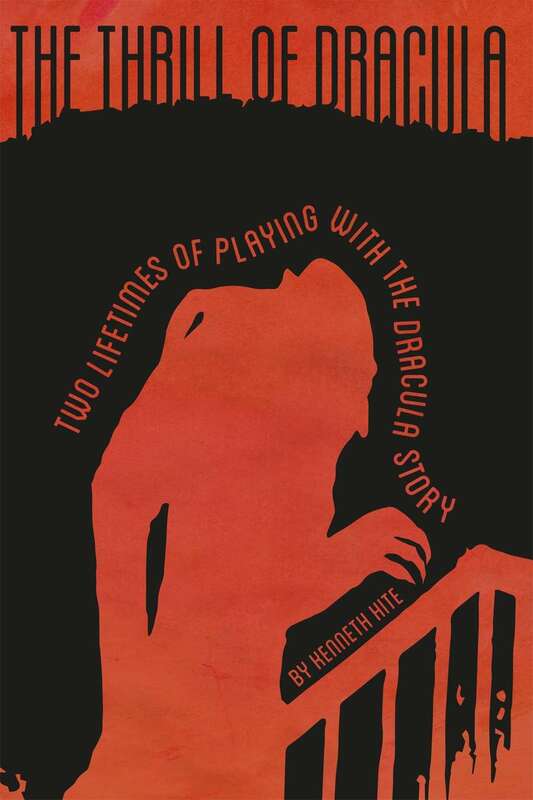 In THE THRILL OF DRACULA, Kenneth Hite takes apart Dracula — the novel, the movies, the myth, even the history — into his component pieces: characters, tropes, symbols, story beats, effects. With those pieces, Ken shows you how to build new yet mythic stories about the King of the Vampires or about your own creatures of the night, tuned for thriller adventure, cosmic horror, or even intense personal drama. This standalone book suitable for all fans of games, storytelling, and Dracula will be delivered in PDF, Kindle, and ePub formats. From the first medieval atrocity stories about Vlad the Impaler to Bram Stoker’s immortal novel to the most recent Universal blockbusters,The Thrill of Dracula zooms through centuries of blood, bats, and – ballet? — to bring you the most complete look at the Count’s story ever! Read the occult mysteries behind Nosferatu,and untangle the shifting time and space of the Hammer Dracula series! Geniuses from Orson Welles to Werner Herzog have remade Dracula – now you can, too! Hite gives you their tools, tools you can use to build new yet mythic stories about the King of the Vampires or about your own creatures of the night, tuned for thriller adventure, cosmic horror, or even intense personal drama. Kenneth Hite takes you on a tour through the cinema de Dracula, from the classic NOSFERATU to the, um, less than immortal DRACULA 3000. Hit the Hammer highlights, the Lugosi limelights, and more — with advice on adapting any or all of them for your own vampire games such as Night’s Black Agents. Today’s Pick is from my own publishing house, Evil Beagle Games – so, yes, definite bias here. Still, I feel strongly about sharing anything from the Michael Subrook Presents line because he does such top-notch work and immense research into everything he does. This one brings you a solid piece of science-fiction real cosmic real estate to drop into any space-centered campaign you’re running, in any system. The Void is a mini-setting for science-fiction gaming, meant to be easily dropped into any RPG setting dealing with space travel and the dangers thereof. It’s system-agnostic, and while there’s a great deal of excellent, well-researched material here, plenty is left readily open to the Game Master’s imagination and capacity for customization. This is another in a series of products Evil Beagle Games is proud to bring you, from the creative and prolific mind and talents of Michael Surbrook. Edited by Leigh Anne Reger. Layout by Ross Watson. 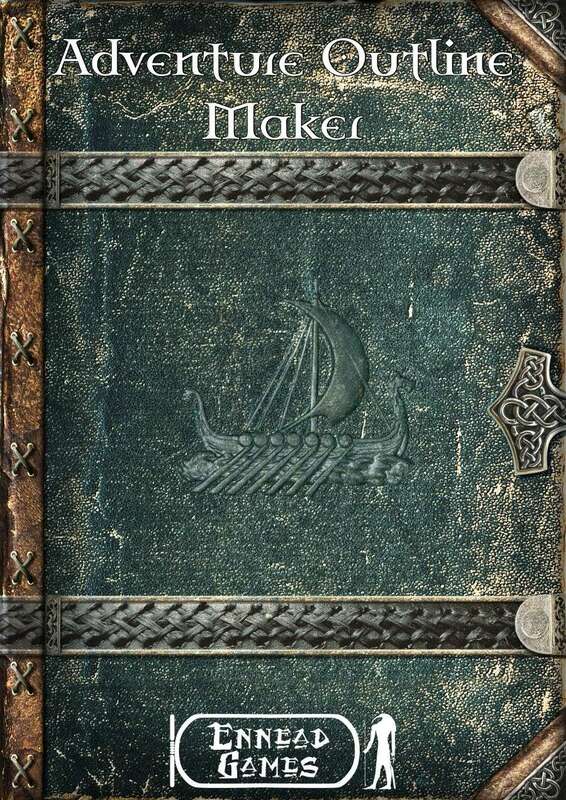 PS – I also want to take a moment to point out the efforts of the Low Fantasy Gaming folks, who have some fun (and free) Old School Gaming swords-and-sorcery stuff happening. Check out this Down Under gem! Trying something new this week, friends. I am posting the actual Picks of the Day over on the ENN News Network, and then doing a weekly roundup of them here on this site. There’s a lot of reasons for it, but the main ones are a larger initial audience for the Picks on their release, which means better revenue potential for me. I’ve never tried to hide that, in addition to sharing what I think is cool stuff for you, I need to make this a working financial proposition for myself, so we’ll see how this goes. As always, thanks for your continuing support and patronage! Welcome to the first day of Sean’s Pick of the Day premiering here on ENN. Naturally, I went with something that fits the Halloween theme, and it’s a great setting that wonderfully mashes up magic, horror, and noir. This is the Third Edition, featuring Precis Intermedia’s genreDiversion rules. A fun way to have some spooky adventure time at the table this Halloween. Sorry for the late post; I was off donating platelets, getting new glasses, and a handful of other things that needed doing today. I did want to make sure you knew about the latest release for the epic high fantasy setting, Shaintar. It’s one of a huge line of books that will make the life of anyone running or playing fantasy inSavage Worlds a lot easier and more fun. This particular book talks about one of the most well-hated sources of villainy in the setting. Mix one part Cardinal Richelieu, one part Inquisition at its height, and one part Nazi party, and you have the Prelacy of Camon. The Church of Archanon is in complete control and that’s just how they want it! Any who criticize or complain are punished or made to disappear. They’ve had generations in power and the populace genuinely believes Archanon favors them and is their God. There may be whispered rumors of a time when there was a King who balanced the Church’s excesses, along with the Cavaliers who protected the nobles. Those days are gone and the rulers of the Church like it just fine this way. 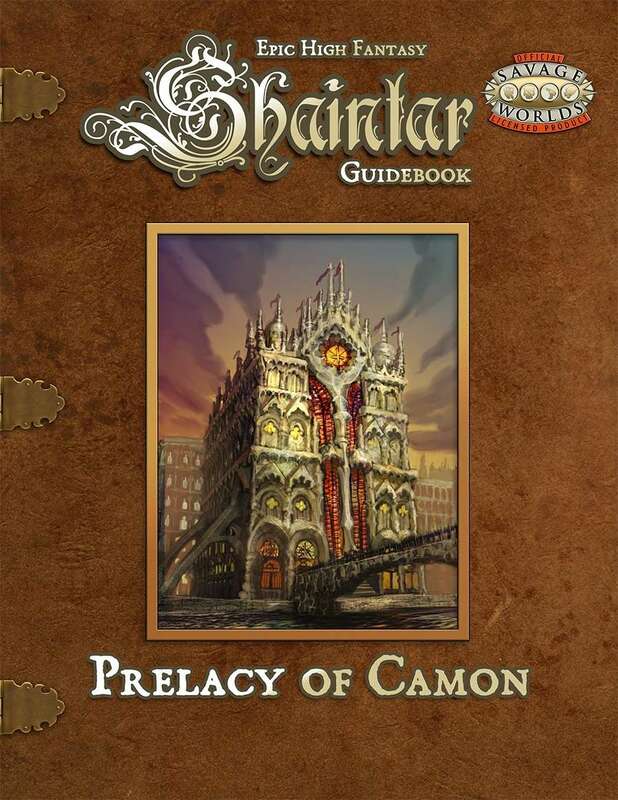 In this book, you’ll learn about the Prelacy, how it came to power and why. There’s a great deal of history in this land and Camon has had a remarkable ability to surprise the southern kingdoms each time it has tried to convert the rest of Shaintar to the Church – at swordpoint. The time is coming when it will be Camon who is surprised. Their lie has been hidden for too long. There’s some new secrets revealed and you’ll learn about the Paladins, each of the Cardinals and the Nobles they rule. We’ve also included a bunch of new gear, edges, powers, and other cool stuff to help you get the feel of Camon within a character or NPC. You’ll also find some new information about the Cavaliers, they may play a significant role in the future of the country. 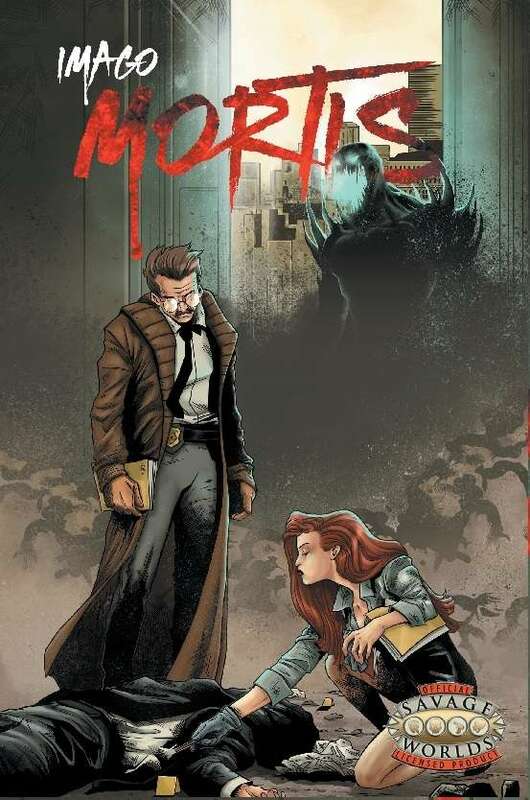 Our friends in Poland are at it again as GRAmel wades into the “hardboiled supernatural noir” space (some would say side-by-side with Deadlands Noir, Trail of Cthulhu and Bloodshadows) with their latest release, Imago Mortis. Syle and substance come together in a very nice-looking and well-executed package as GRAmel continues to hone its collective craft to a fine edge. Prophecies and investigations point to the same direction, signs and clues are both used to solve cases, Spiritists and Private Eyes are starting to co-operate. 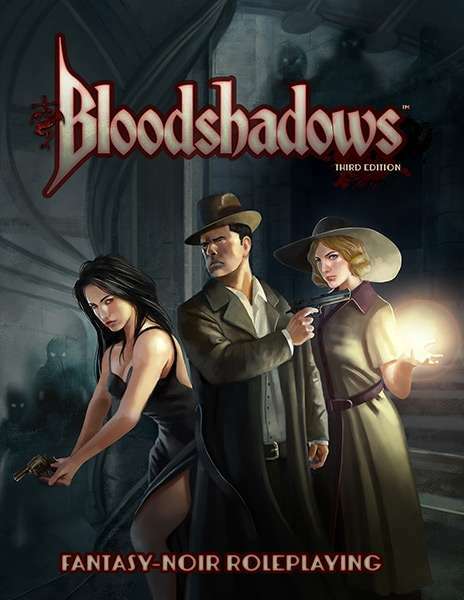 This is a mix of genres that Savage Worlds handles exceedingly well, especially if you’re keen to have a healthy dose of action with your detective stories. 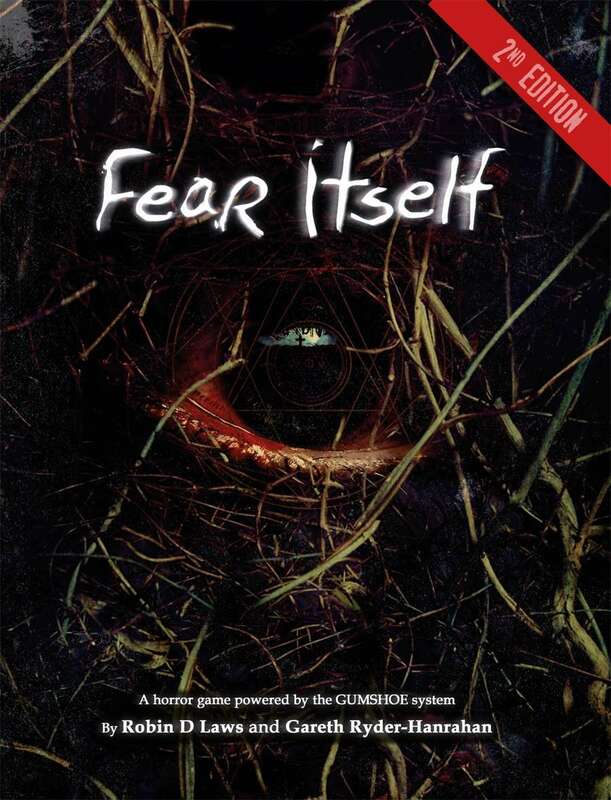 It would seem Halloween clings to our collective conscious this week, as Pelgrane Press releases the second edition of its game about personal horror and alien terror. This time around, the GUMSHOE system is used to delve into non-Lovecraftian madness – or does it? Cthulhu’s never mentioned, but it’s hard not to see the influence. For those looking for a solid foundation for their post-medieval, non-fantasy 5th Edition creations, Dias Ex Machina Games has a highly popular and very effective option. The release of this OGL/SRD iteration of their Ultramodern5 product means you’ve got a single toolkit ready-at-hand to start creating your setting and adventure ideas in the latest version of D&D rules. 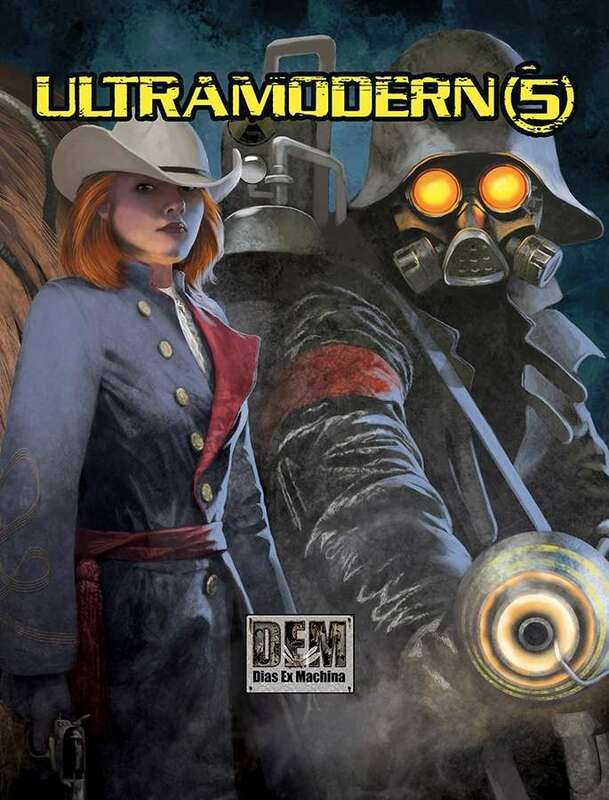 Ultramodern5 is presented as an SRD under the OGL to both support 5th Edition and to encourage more alternative games using the system. We are hoping that this SRD will be used in the spirit it is offered. All new rules presented in this file are considered open content. As there is no artwork, characters, or maps included in this edition, they are not open content. This file is only offered for the purposes of reference, and as such does not include a contents page, an index, artwork, maps, adventures, or setting ideas. Ultramodern5-SRD/OGL is offered as a “Pay What You Want” if fans wish to support Dias Ex Machina in producing original content. Alternately, you could purchase the official Ultramodern5 book, which does include everything removed from this SRD. It presents classes, gear, and scenarios that can be inserted into any campaign.